How many of us would love a bigger lounge or living room? Maybe you live in a modern home with multiple smaller rooms, or perhaps the space just isn’t big enough for you and your family. Whatever the reason, there are lots of ways in which you can make the most of the space you have and in some cases, create the illusion of a bigger room. I’ve done lots of research on this in the past so here are my top tips for adding some extra space into your living room. 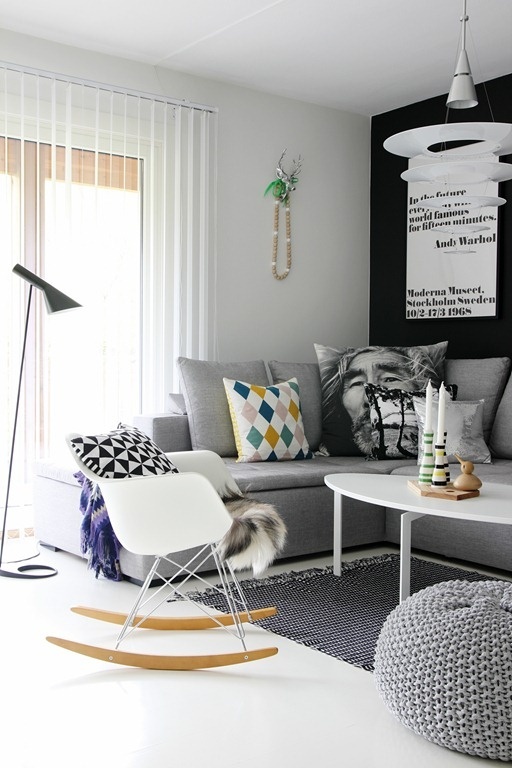 Just because you have a small room doesn’t mean you should shy away from using colour in it. Whatever you do don’t use white, you will be left with a small room painted white which won’t necessarily give an illusion of space. Instead choose colours you love, look at the type of paint you buy and choose a light reflecting version. This will help bounce light around the room making it feel larger. Think about how you mix your colours when you create a feature wall. Remember dark colours will make walls recede but highlighting a chimney breast will make it protrude further into the room. This Farrow and Ball post has lots of tips on making the most of colour in your home so do check it out. I love the idea that painting coving or cornicing in the same colour as the walls, will give the illusion of height. And did you know a white ceiling will actually lower it further into the room? Pieces of furniture with open bases work best in smaller rooms. Sofas on legs, Perspex coffee tables, glass and light woods all work well, allowing light to flood through and the room to feel more spacious. Instead of lots of smaller pieces of furniture go for one or two larger pieces. For example larger 3 seater sofas instead of individual chairs will create a more unified space. Habitat has a lovely sofa & armchair range that works well in smaller spaces and in the modern home. Bounce light around the room as much as possible off reflective surfaces. Use mirrors opposite windows to maximise light. Remove doors if practical to allow the eye to move through the space to the room beyond. Think about your window dressings – do these maximise light into room? Neater blinds or window film will also be less fussy and help in creating more space. Clever storage is essential in smaller rooms. Think about utilising every spare inch of your room if you can and ensure everything has a home. Coffee tables that double up as storage for magazines or extra throws and cushions are great. Hide away all your DVDs and CDs in storage boxes; remember less smaller items, and few larger items will create an illusion of space. If you have children make sure you have enough storage for their toys, behind sofas or in cupboards, and clear them away at night. Sitting in a serene, tidy space in the evening will lead you to believe your room is far bigger than it is. And so there we go, lots of lovely ideas to ensure your smaller room feels bigger. What about you? Do you have any tips for creating illusions of space in your home? Previous Post Are Walk-In Wardrobes Now More Important than Local Schools For Housebuyers?